My advice is to start your preparations four to six weeks before you start playing matches. During the first two weeks you should do lots of on-court routines and off-court aerobic fitness work (eg: on the bike). Every other day you should be doing a bit of weights work. I do a lot of leg work to give me power around the court and upper body work to keep me symmetrical. Over the next two weeks you should play conditioned and normal games. Concentrate on what you want to improve rather than on winning the games. Also do some quick ghosting (20-30 seconds, no more) and keep up the weights sessions (light weights, more reps). Before you actually play a match you want to make sure you’ve hit plenty of balls but at the same time that you’re well rested. But what about the mental preparation? The key is to set yourself goals and have a clear idea of how you want to play tactically in your matches. Don’t just wander through your training routines. Every shot is important, even in practice, and needs your full energy. Even when you’re in the gym you should be concentrating on the good it will do you on court. If you play practice matches before real matches, don’t worry if your game isn’t as polished as you’d like it. Be patient. You goal should be to play well when it counts. Once I actually start playing in a tournament I let myself go onto auto-pilot. I try to play within “the zone”. This means I’m completely relaxed and I let all the practising and training speak for itself. This is my training day. Whatever training you are doing try to get into a routine. It will help a lot. I wake around 7.30am and have a large breakfast (a smoothie or milkshake with fruit plus six pieces of toast and cereal. During a training period I normally feel tired and stiff. This is normal. It’s important to get motivated and work out what you want to achieve in a training session. On arriving at the club I warm up by running for five minutes and stretching. I then hit alone on court for a while and stretch for another 15 or 20 minutes. Then I start on a session with some of the guys in our squad. Physically we work hard. Nearly all the movement is from the T, exploding off and pushing back to it again. Our routines are based on what we want to do in a match situation and we are aware of this mentally. We’re not just practising shots, we’re training and disciplining the mind. Then we start condition games (games with special rules that let us concentrate on something we’ve been practising. Just before lunch we do abdominal exercises and a good warm-down and stretch. After lunch we might have a little nap. The afternoon session might consist of interval training on the bike. I try to think of hard rallies in a match when that extra push is needed. Again I will stretch before and after the session and do some abdominal work. I eat early in the evening and try to relax for a couple of hours with something totally unrelated to squash. Later in the evening I stretch for about an hour, preparing myself for the next day. I get to sleep early. I deserve a rest and my body needs to recover. Use basic practices to groove and improve your shots. Make time for this perhaps before you play. It can have a big impact on your game in the longer term. Concentrate on doing a few practices well. My basic practice is the boast and drive routine. Starting at the front of the court I concentrate first on striking the ball, turning my shoulders, staying away from the ball and making sure I open the racket face and hit the ball sweetly just in front of my front leg. After hitting, movement back to the T is crucial so that you can practise your positioning for the next shot. Practise getting in the right place for your shot and try to eliminate casual shots. Drives should be hit flat and you should be always trying to beat your opponent with the shot just as you would in a match. When boasting, position is all important. To get the ball up consistently under pressure, you have to be back with the ball and far enough away from it to get a full swing in. Make sure you get behind the ball. Under pressure I tend to hit the safer three wall boast, but when I’m in a more attacking position I move my opponent up the court with a two wall shot. Take opportunities to hit by yourself to improve and groove your skills. This is what I do. Develop your own routine. a) Easy hitting: I start with easy hitting to the service box. I warm the ball with volleys, then drive and volley to warm myself up, get my eye in and get some consistency. I move my feet for each shot so that I’m in the best position. After easy hitting on both sides I move to the back corners. b) Full length driving: It’s better to be longer than short. Step in and out of the shot, turn the upper body to face the back, get the racket up and try to be ready and waiting for the ball. Get a rhythm, use medium pace and concentrate on getting the ball right through and straight. c) Low drives and kills: From the back of the service box I practise short kills with cut and low drives angled to bounce and cling and which come back three-quarters the way down the court. d) Volley kills: From behind and at the edge of the service box I hit hard volley kills with a bit of cut, but with a short and controlled swing. e) Drops and volley drops: From around the short line I hit volley drops (softer with touch) and drops (with more cut). If I have an angle I go for the nick. If not I play it to bounce on the floor and cling. f) Short shots: Short drops I practise by feeding it short and moving in from the T; counter drops I feed short with controlled movement, concentrating on getting the ball tight on the side. 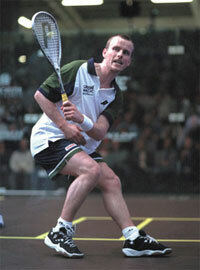 Volleys are the key to playing squash at pace, pressurising your opponent and creating time for yourself. They let you keep the middle and get in front of your opponent. The player in front wins. Always look for volleying opportunities during a match. If your opponent makes it back to the T you should look to follow up with a second volley to get him out of position. Don’t just whack the ball around on the volley or speculate with volley nicks. Use the volley to dominate the T and use variation to avoid being predictable - various paces of straight drives, crosscourts and boasts. Think about using combinations and think ahead. 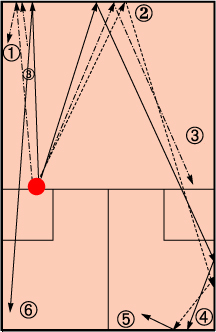 Look to follow up your short shots by intercepting and making opponents scramble back for dying length volleys. If you’ve gone short try to intercept and play long. If I’m travelling to an event I arrive at least a day before my first match. Having checked all my kit before departure, I unpack and then familiarize myself with the hotel, venue, travel times, practice times, the courts and the match times. Then I make sure I eat well. Now it’s time to switch off, stretch, watch a film and maybe get a massage. Generally our matches are in the evening so there’s no rush to get up in the mornings. If I’m playing at 9pm I may get up at midday, practise at 2pm and relax. First I have a light breakfast and wait for my practice. I always practice on the court I’ll be playing on even if it means practising at strange times. After practice I stretch, shower, eat (lots of pasta and water), relax and switch off. Sometimes I might havwe a nap. Then I start thinking about the match, making sure I’m alert, aware, sprightly, heightened, but not tense. Mental preparation is crucial. At the venue I sometimes watch the match before I’m on. Then I warm-up, stretch and do some explosive bounding so that I’m ready to play at full pace. I also do shadow work with the racket and practice turning and jumping. On court in the knock-up I try to stay comfortable, hit the ball well, see it well and feel lighht on my feet. I give myself reminders by saying ‘On your toes’, ‘Keep away from the ball’, ‘Be aware’, ‘Focus on the ball’. Sometimes I try out different shots and angles to test my opponent a bit. Then I’m ready to go! Here’s little time to think during a squash match, so much of your thinking has to be done before you go on court. This is your gameplan. You should practise it in practice sessions and games and discipline yourself to stick to it during matchplay. But know when to change it if it’s not working. b) Take the ball early. c) Control the T, feel sharp and aware. d) Take opportunites to attack. To get my opponent in the back corners I hit low and hard so that they can’t intercept and have to scramble back for the ball. I hit flat with some cut which helps the ball stick in the back. My strengths are to get onto the ball early, hit a good length and make my opponents work hard getting to it. This makes them concentrate on stopping me rather than getting on with their game. Applying this kind of pressure forces opportunities for me to attack. My tactics are to get the ball deep, get my opponent stretched and force the weak ball or tactical error. Then I can attack or send an opponent back deep into the corners again. This is the pattern of a rally. First I set up the rally with length, apply pressure to an opponent and look for opportunities to attack. Just one attack is not always successful so I don’t become rash and lose my tactical discipline when they get the ball back. I just set up the rally again and try to force the next opportunity. Movement to and from the T is the axis around which the game revolves. To recover the T and if possible dominate it is one of the fundamentals of the sport. Today you cannot play the game from the back of the court. The player in front wins. It’s as simple as that. Recover quickly from your shots and get back to the T. But make sure you are steady and balanced when you hit. As you finish your swing, start moving out towards the T. Try to keep it all as one smooth movement. If you play your shot in the front corners you’ll have to push back a bit more dynamically to reach the T, but if you’re at the back of the court you can turn out of the shot. Once on the T you should be perfectly balanced and ready to go in any direction. If you’re anticipating a straight shot you should hang into the side a little and look to intercept it. If a crosscourt is a possibility you should take up a more central position. If a short shot is a possibility, move forward on the T to cover the front of the court. For me, squash is like perpetual motion. I try to keep moving so I’m not stopping and starting all the time or using heavy lunging which will tire me out. a) Straight volley drop: I play this off both the crosscourt and straight drive. At the top level, taking the ball on the volley is very important. Pros can cover most things but volleying cuts down their time. b) Drop off the boast: A boast, especially a forced one, can provide a major attacking opportunity to drop or to hold and drive again to put more pressure on. Sometimes we get involved in drop exchanges where we are angling the drop to cling onto the side wall and it is difficult to get a full swing at them. 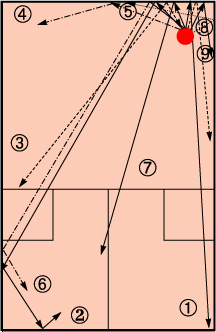 c) Interceptions from the front: After the drop I look to pick up the volley and punch it away straight for dying length. Often, all an opponent will be able to do with a tight drop is to hit it up straight or crosscourt. d) Kills: One of the things you are trying to do when pressurising an opponent in the back is to force weak mid-court or three-quarter court balls that you can kill. An opponent has to stay behind to avoid being stroked and you have the opportunity to straight kill, fading it into the side so that it doesn’t rebound. If it is not a winner, it often forces a weak ball that can be hit away. e) Short variations: Pushing an opponent deep can frustrate them so that they play short from the back corners. This can allow you to pounce from the T onto a short ball with a counter drop and then follow up looking for the intercept; or hold and hit deep again, perhaps with some deception, letting them come back to the T and then send them deep again. f) Wrong-footing boast: Sometimes when I’m forced behind an opponent on my backhand and I can sense that they are hanging in looking for the volley because they have got in front of me I will throw in a surprise boast, if I can get the ball before the back. When they are committed to volley this is a difficult change of direction. As squash players we want the advantage of reading an opponent’s play, but we want to make it difficult for our opponents to read us. We want to keep our opponents guessing by using variations and deception. Using variations can hold an opponent in position longer before they move or can catch them out with an unexpected variation they are slow to read and to move to. Deception may wrong-foot an opponent and make them move the wrong way, necessitating a time-consuming change of direction. In your game, work to develop the attacking side of your play and work on developing variations and deception. Be prepared to experiment a bit in your practice games and be prepared to mess up while you are learning. Variations are really different alter-natives from the same positions on court. Try to set up the same way for a selection of shots as this helps disguise them. Later you can add deception by holding the shot or by showing one shot and playing another. The idea is to keep an opponent guessing so they don’t know what’s coming next. There are two examples here. One shows a mid-court positon with some of the alternatives I look for. The other, in the front right corner, is my strongest attacking area; attacking a right-hander’s forehand where it is harder for them to get into the corner. In this second example from the same set-up position I have a whole range or shots and I can generate a lot of pace off a short swing which allows me a range of variations and disguise.